It really is just getting more and more entertaining. Last week we have announced support for new Google Chrome Pushes, a technology soon-to-become the breakthrough in multi-channel pushes, from a single website to desktops and smartphones around the world. However, Apple is going to have it in its own way. Do you want to bring it closer and make it personal? You got it! 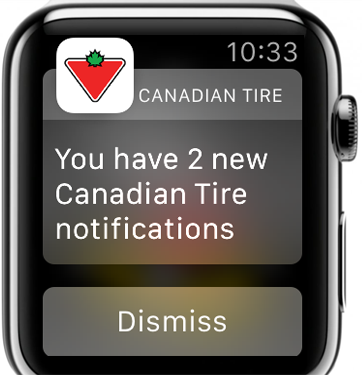 To start with, all existing apps can make their way to your user’s wrist through push notifications without any changes in the SDK, although we do recommend you to release an update with Apple WatchKit somewhere down the road. We are still experimenting on all the tasks you can perform with this adorable device, however, it is already clear — we are going to have one hell of a journey. 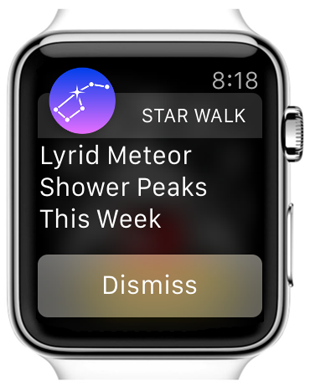 For instance, Star Walk, one of the most beautiful brands we have on board, already launched a new version with Apple Watch support, and we are pleased to get the latest updates straight from heaven in an elegant way you can see on the title image. Next time it would be definitely a good hint to get off your desk and start skygazing! In this feed you can review your pushes and interact with them, or clear them out. Here comes the first fun fact: if you dismiss the push on your Apple Watch, it will be simultaneously cleared on your iPhone! What does that mean? No more hassle with the mess on all your devices getting notifications at the same time and going through the full messages list on each and every of them one by one. Yes, you could support this handy feature with custom settings in your app. And yes, now you don’t have to. It just works! You need to keep it in mind: Apple Watch is a symbiotic companion for your phone, not a fully separate device. Some call it a second screen, though it is far from truth. It has its own interests, it will keep you going with Activities, it will measure your heart rate and help you with time management. However, if your new friend has to be offline, it is offline. Don’t worry, you will not get spammed by hundreds of missed pushes or calls when it comes back on air. You’ve still got your iPhone, don’t you? On the other hand, when Apple Watch is online, it takes some burden off your smartphone and people who surround you. If it receives the push, it will make a sound and/or tap you on the wrist (please welcome the haptic technology), and your phone will stay silent. Yes, your watch will take on the full responsibility for delivering the important news to you, and rumor has it the “discreet tap on the wrist” feature alone can make a revolution in business negotiations and public events. And yes, there can be more than one button. We are still yet to adjust the behavior of Categories that were introduced in iOS 8, however, it is safe to say that they will interact in a similar way to the interactive pushes. They are being displayed already, and you can try our Demo app to see for yourself. 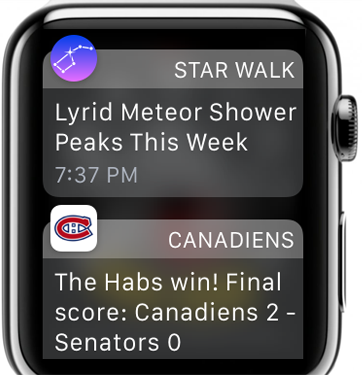 We just all need to get there with full capabilities of Apple WatchKit. Too many rainbows and unicorns? Well, consider this: the Watch might stop receiving pushes somewhere between 20% and 10% of your remaining battery, and will not warn you about it. There have also been reports some people got so annoyed with Watch pushes they would turn them off completely, but it all really depends on how you treat your audience. Just be respectful! The main purpose of this review is to give you the idea of the new powerful instrument that makes our pushes truly become a part of users’ life. We live in a fabulous time when new technology or new devices arrive every week, and this one definitely came to stay. Once again we want to remind you that with the great power comes great responsibility. Don’t be intrusive, talk about what matters, inform, educate, entertain, help out, and may the Force be with you!